It took me a bit of time to find a connection with Jeff Danielian’s first book of poetry, Seasonal Ramblings. As I read through the first section, “Through Time & Space,” I felt like I just was reading words on a page. There were a few interesting lines here and there (“Language is about the crisis of the world,” “Awoke with my friend on the day of his birth.” “Notes echo throughout the land,”) and a couple stanzas had me nodding my head with approval, but I mostly felt that I was reading a run-on sentence on a never-ending loop. “Through Time & Space” seemed, at least to me, to be the very definition of a seasonal rambling, but I persisted. “There Comes a Time,” the second section, seemed like more of the same. Slightly shorter than its predecessor, I read still awaiting my hook. But, there were improvements right from the start. “There comes a time in every man’s life when he finds a woman that enlightens his soul” is a great beginning, filling my head with the image of the enlightened soul and rhetorical questions to accompany the view. It took a little bit before my brain started trying to pull meaning from stanza to stanza. It seemed at first to be a love poem that could have gone a few ways (expressing love, the pursuit of love, trying to recapture the love), but it soon drifted from that, coming back every few stanzas or so, just to remind me of how it started. “I Wonder Where” continues the extended path of the previous two, though I enjoyed this a little more than the previous entry. It made me want to sit outside and enjoy the beauty that surrounds us. Flowers, delicious descriptions of the sky (“Red has replaced green as orange to yellow”), the seasons, morning, nighttime, air, weather; the outside world is on full display. While still a long piece of work (27 pages), Danielian’s thoughts have been tightened up. He sticks to his central theme, painting beautiful images and thought-provoking lines. He ends with two (much) shorter poems, “Now I Lay Me Down” and “Disappearing World.” The former reminds me of Johnny Cash’s “I’ve Been Everywhere,” while the latter seems to have a don’t-blink-and-miss-your-life message to it. By the time I started reading “Midnight Sky,” the final section, I was hooked, turning pages frantically, excited to read Danielian’s next words. This section comprises 47 short poems — it was the reading version of listening to Agoraphobic Nosebleed immediately after Sleep. I buzzed through these poems with excited enjoyment, relishing in the simple images that were painted. Everything got right to the point, and each spoke to me. “Denim” is an ode to a favorite pair of jeans, “The Furniture Maker’s Daughter” is what you would expect it to be, and “Easy” just rolls off the eyes with wonder. “Almost All the Leaves” is my absolute favorite, about nothing more than a tree and leaves in the fall. I couldn’t help but reread it over and over. The simplicity of the forth section reminded me a great deal of William Carlos Williams. Both made ordinary, everyday things that are often overlooked and taken for granted, memorable. This is not a simple thing to do, and I commend Danielian for making it look easy. Despite the slow start, I highly recommend Seasonal Ramblings, and the payoff reminded me why I enjoyed being an English major in college. 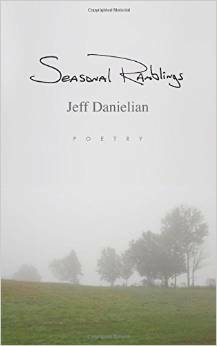 Danielian takes chances to varying degrees of success, but he gives the reader at least a few poems that they will want to read over and over again.